1. Soups are mostly simple to prepare. Besides being simple to prepare, they can often be an entire meal by itself. 2. Soups complete a meal. It’s always “classy” to serve soup as a starter, especially when you have guests around. 3. Soups promotes weight loss. We are not referring to those creamy soups with half a block of butter and double doses of cream in it. We are talking about healthy soups, like a lean chicken soup, clear vegetable soup, cream-less tomato soup…etc. Studies have also shown that starting meals with a healthy soup actually promotes weight loss. 4. Soups can be inexpensive. Obviously we are not talking about shark’s fin soup. Why would we eat endangered species anyway? Not cool. Tomato soups, corn chowder and celery soups are examples of soups that are fairly cheap to prepare. You can also use cheap cuts of meat for soups. 5. Soup is a great way to clear up your pantry/fridge. You have 3 stalks of celery, a couple of tomatoes and some herbs that would be making it’s way to the rubbish bin in a day or two. Why waste those? Grab a can of beans and a few other staple ingredients and you would be rewarded with a pot of hearty chili. Most soups can be adjusted according to the ingredients that you have in the fridge or pantry. 6. Soups can be made ahead of time. Make larger batches of soup, freeze and thaw whatever that is required. 7. Soups cook perfectly in a slow cooker. Before leaving for work, throw in chicken, onion, garlic, ginger, coriander, cumin, carrots, white pepper, salt and water in the slow cooker. Boil some macaroni after work and and there is your chicken soup and macaroni for dinner. Healthy AND delicious. 8. Soups can be eaten with staples easily. Crusty bread, pasta, rice. Yes almost everything. 9. Soups are lower in calories. Soups that are broth-based are also low in energy density, meaning they have relatively fewer calories per serving. If you need to drink at least 8 glasses of water a day and you have troubles meeting that “quota”. Drinking 2 bowls of soup would mean that you can drink 6 glasses of water instead of 8. My bestfriend said that this sounds silly. For me, it’s just logic and basic mathematics. 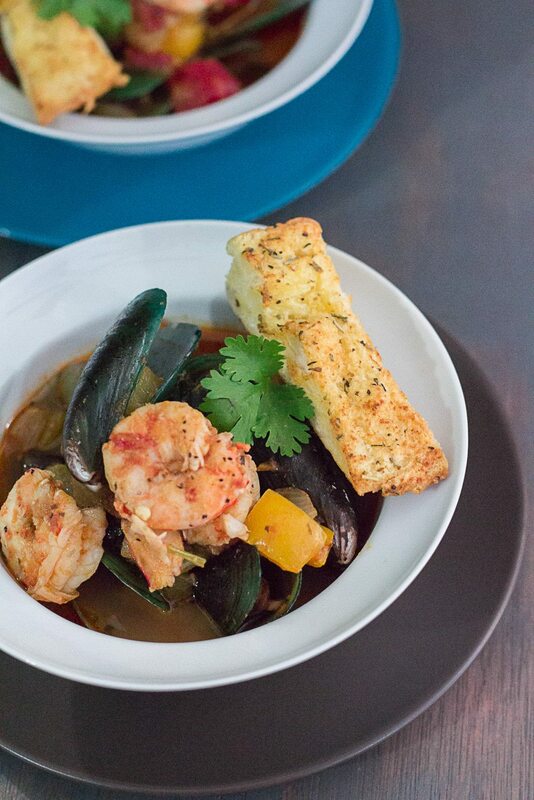 This seafood soup is nutritious and filling and as the title suggests, it is also quite easy. I have noticed that most seafood soup would call for some kinda stock. Some would use commercially made stock where else the others would require you to boil ingredients like clams, prawns shells..etc. I personally am a fan of using home-made stock but somehow for this dish, my opinion is that we can skip that part if we are already using quite a number of seafood. The seafood itself would give the flavor to the soup without a need to add more stock. 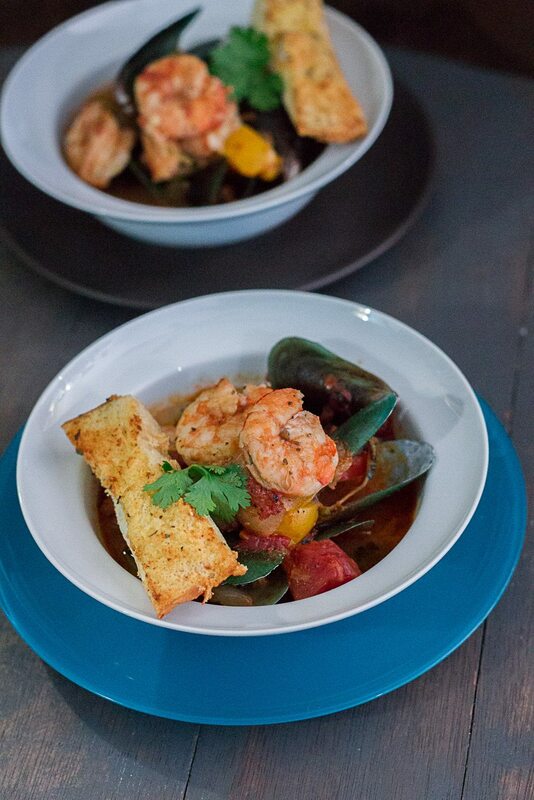 This Easy Seafood Soup is perfect when you do not have much time to cook or you are not in the mood to fuss too much over dinner. 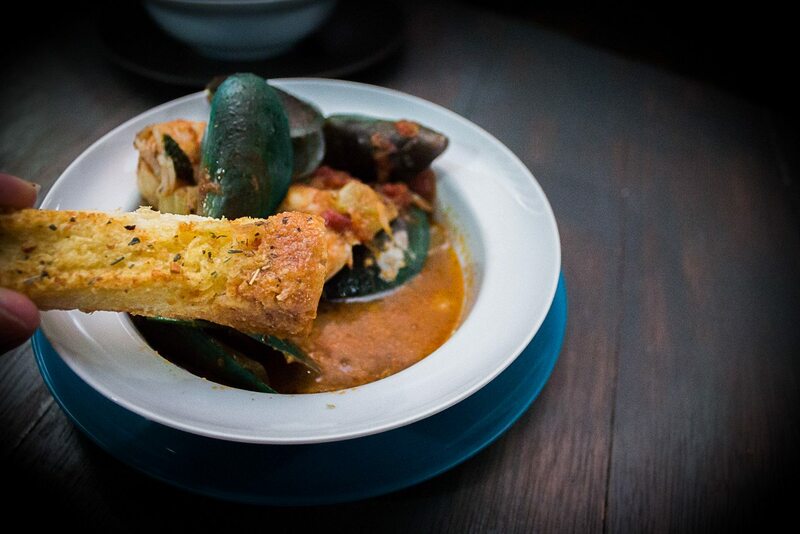 You can pack the soup with your choice of seafood; from prawns to slices of fish, clams, mussels and so on. You can also add some vegetables to the soup. In this case, I used celery, onions, tomatoes and peppers. 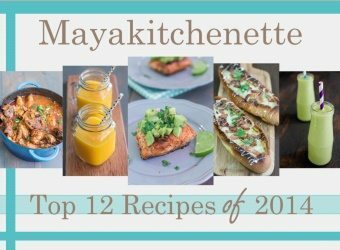 This is a fab recipe, so simple to make and tastes delicious. I sautéed the vegetables, cooked the soup and added the seafood towards the end. I served these with garlic bread. In fact, any crusty bread would be perfect. Do give this delicious recipe a try people, but please remember “good manners is the noise that you don’t make when you are eating soup. Happy soup’ing people! Heat the oil in a large pot over medium heat. Add the celery, pepper, onion, and salt and saute until the onion is translucent, about 10 minutes. Add the garlic and red pepper flakes, and saute for 2-3 minutes. Stir in the tomato paste and cook for another 2 minutes. Add tomatoes, water/stock and bay leaf. Cover and bring to a simmer. Reduce the heat to medium-low. Cover and simmer for about 15 minutes. 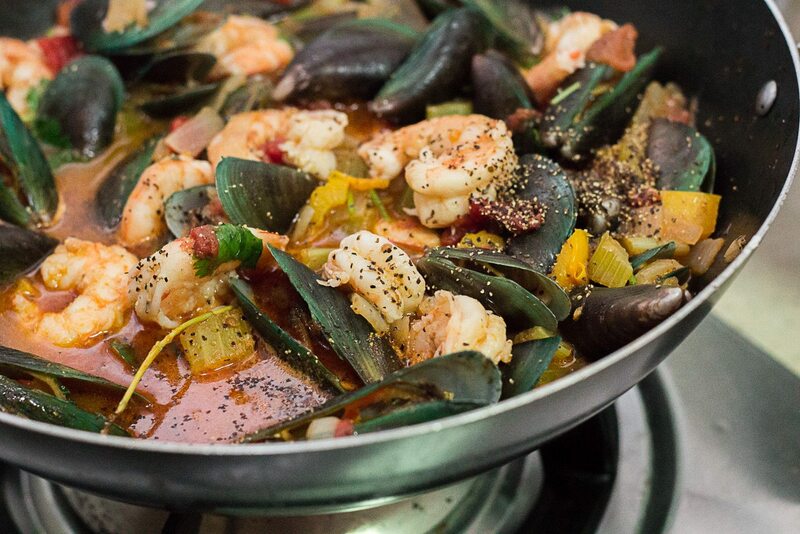 Add the clams and mussels to the pot and cover and cook until the clams and mussels begin to open, about 5 minutes. Add the shrimp and fish, if using. Simmer gently until the fish and shrimp are cooked through. Season the soup with more salt and red pepper flakes. Ladle the soup into bowls and serve with crusty bread or garlic bread. Man, this soup has all my favourite things. Your photos make me want to dig right in!